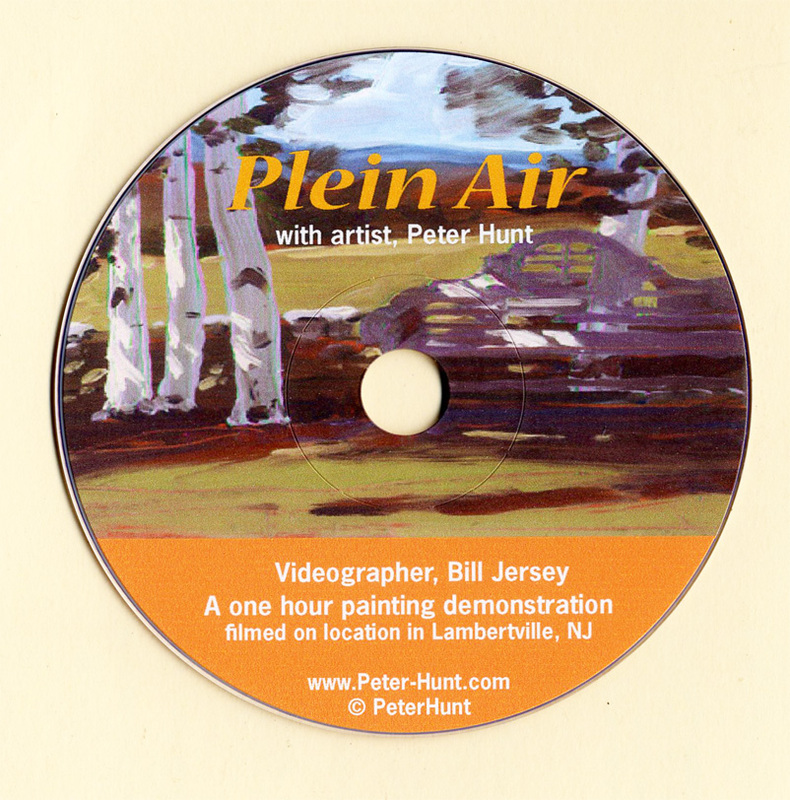 The DVD is a one hour Plein Air Oil Painting Demonstration from sketch to completion - on site. It is entertaining and instructive. The painting subject is an historic building located amid fall foliage, on the canal in the picturesque town of Lambertville, NJ. Throughout the video, the friendly videographer is carefully watching the painting process as it proceeds and asks his searching questions about materials, how they should be used and how best to pare down painting equipment for the outdoors. Other important subjects such as paint selection, color mixing, painting surfaces, brushes etc. are fully addressed by professional artist Peter Hunt, as well as basic painting issues such as sketching, composition, the quick transfer of a composition from sketch to a painting surface and many other tried and true helpful hints to make your painting experience outdoors a success. The video is $30 plus $5 Shipping and Handling. Free with this purchase is Peter's Pocket Field Guide to Plein Air Painting in oils. A handy folded map that references materials, painting methods and locates good painting sites along the Delaware River for the Plein Air painter. It fits neatly inside one's paint box or hip pocket.